In short, Buddhism is the religion of Sekha or education. Three Sekha has been exponentially repeated by the Buddha: Sila Sekha or the education of morals, Samadhi Sekha or the education of meditation, and the Panna Sekha or the education of wisdom. These 3 Sekhas is illustrated quite interesting in the Eightfold Path such as Sila Sekha is inclusive in right speech, right action and right livelihood; Samadhi Sekha is inclusive in right effort, right concentration and right meditation; Panna Sekha is inclusive in right thought and right view. Dhamma delivery approaches of Lord Buddha stresses on three levels: Athi Kalyani or preliminary discourse (Sila), Machhe Kalyani or secondary discourse (Samadhi), and Pariyosana Kalyani or highest discourse (Panna). These three levels of discourse is comprehensive in the Viniya Pitaka, Sutta Pitaka and Abhidhamma Pitaka. Or at the Sutta level, these 3 approaches are Morals/Ethics, Meditation and Wisdom. For Cambodia, human resource development is one of the factors among natural capital, financial capital and social capital. In the past, French tried to pressure on Khmer Buddhist Sangha to serve the protectorate’s missions. But when there were perpetual struggles from the Buddhist Sangha, French protectorates agreed to open a Buddhist Institute (BI) to provide space for Cambodian Buddhist monks to learn and create an education at a systemic structure. Suzan Karpeles was the first director of the BI. Scholars have noted that BI is the substantial place for developing nationalism and movement in late decades in liberating and protecting Cambodian nation. Somdech Chuon Nath is the key leader in reforming Cambodian Buddhism and building productive national central nationalism. His work in translating Tipitaka into simple Khmer language is a great move in modernizing Cambodia. At the moment, the 60,000 Buddhist monks residing in over 4000 monasteries are the important agents for human resource development in Cambodia. But the lack of giving enough aids to those agents in approaching human resource missionary. If those Buddhist monks are not properly equipped with talent and knowledge, Cambodian Buddhism would be just symbol or a tool for politicians to utilize it, and the future of human resource development in Cambodia will be irrelevant. – Since the Angkorean era, Buddhism and Hinduism have played important roles in developing human resource in Cambodia. The startling structure of temples and inscriptions are the evidence of building human resource for the development of this nation. – Buddha is the awaken one. His teaching has been used in modern day such as human rights, democracy, human freedom and equality. People desire for peace, freedom and basic rights which this desiring is fundamentally deriving from Buddha’s teachings. According to the lecture by Ven. Dr. Hok Savann, Cambodian Buddhism and Cambodian Society is inseparable. Thus, Buddhacakra (Buddhist dimension) and Anaacakra (secular dimension) must be lifted up equally. Buddhist laws and the universal human rights law is the same. Buddhist belief and Buddhist thought is considered a tort law or traditional law which is required the enforcement of secular law (national constitution and sub-decrees) to duly serve society. Cambodian Buddhism is very substantial for legality, unity and social engagement. Without durable legality, unity, and social engagement, Cambodian society is hardly advancing. However, the respect of the rule of law must not happen only among lower citizens, the upper administrators must be duly obeying it as well. For instance, the lower thieves who stole chickens and ducks have immediately been punished but the thieves who are sitting on office chairs are immune of punishment. Ven. Dr. Hok Savann doesn’t support the participation of Bhikkhu monks to vote or to choose secular leaders in each national election. Buddhist monks in Sri Lanka have become members of parliament but the image of Buddhist monks in the assembly are not appropriate at all among those lay law-makers and the practices of the assembly. Regarding to Ven. Luon Sovath whose Buddhist top administrative banned from the temple is not due to the Viniya of Buddhist Sangha order. Ven. Luon Sovath’s activities and involvements with those victims of land grabs and forced evictions are not offending any chapter of the Viniya. It is just a social norm that Cambodia has never had monk like Ven. Luon Sovath. If the top administers of Buddhist Sangha accused Ven. Luon Sovath of violation of Viniya, they have to sit down and point out what parts of Viniya has he offended? Banning from the temple is an absolute order which Buddhist temples are owned by the laypeople; and it could not solve the problem. 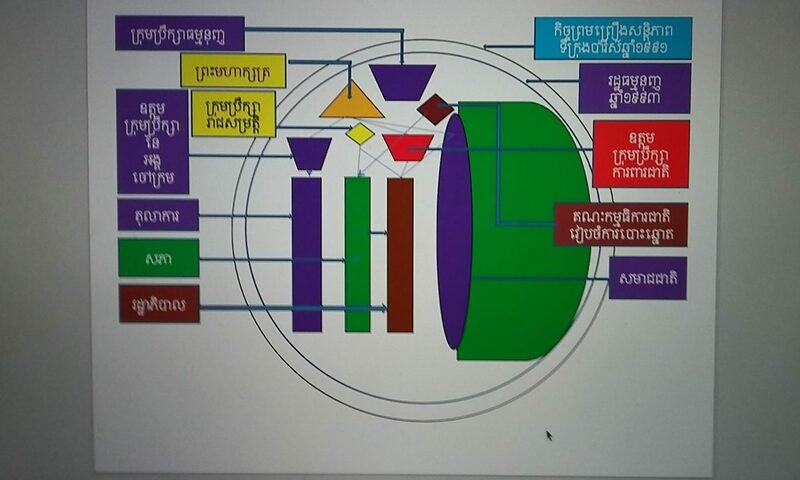 Otherwise, it is showing the not-independence of Buddhist Sangha administrative in Cambodia.